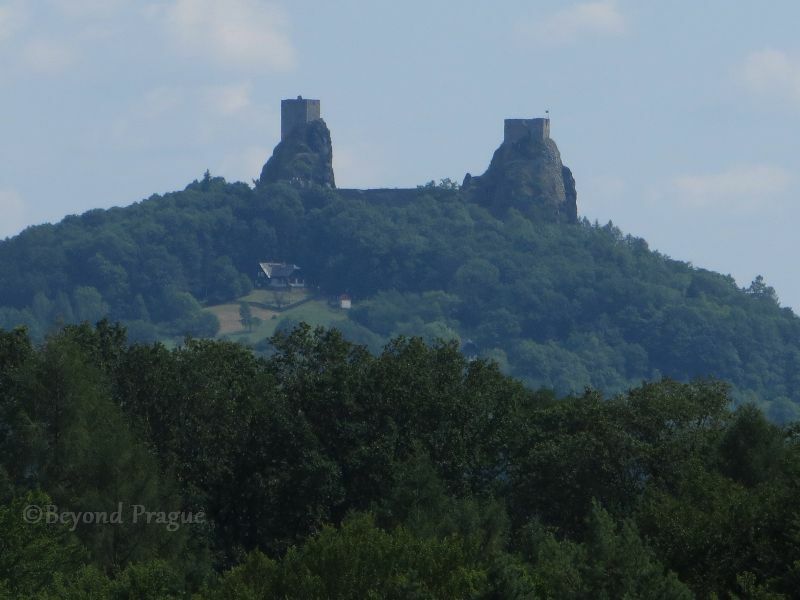 The silhouette of Trosky castle is easily visible from many places in Český ráj. 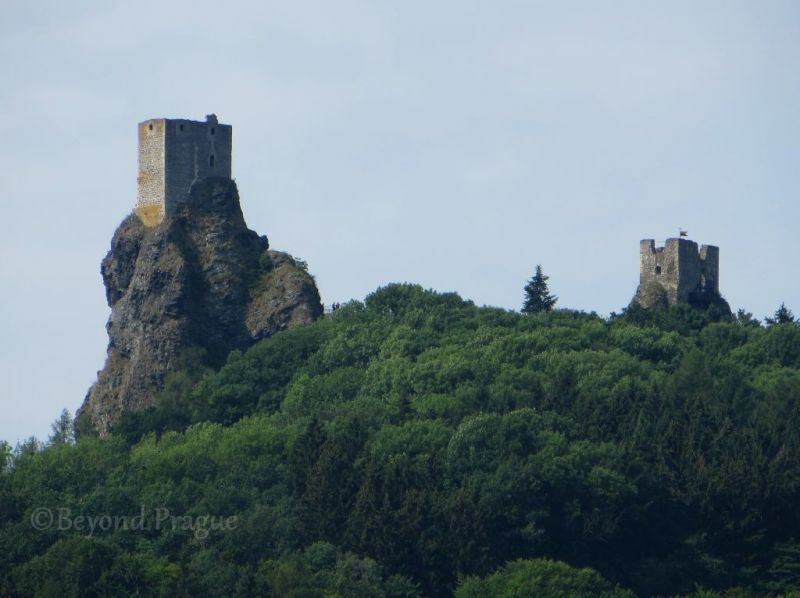 Built upon a pair of basalt crags that are the remains of ancient volcanoes, a pair of towers dating to the late 1300s mark the remains of Trosky castle. A veteran of the Hussite Wars and the Thirty Years’ War, Trosky was a virtually unassailable stronghold in its days as an active fortress. Today, the ruins of the castle still pose a challenge for anyone wishing to visit who does not have a car or are part of a coach tour. Trosky’s sihouette is the de facto trademark of the Český ráj tourist region and can be found on a multitude of postcards and other souvenir items from the area. It is one of the most easily recognised landmarks of the region. Looking toward the Panna tower. Trosky’s defining features are the two towers which can be seen from a great distance. The towers are nicknamed Baba (old woman) and Panna (maiden). Historically, the castle had a quite sophistcated system of fortification walls and gates for its own defense. The walls were up to 2 metres thick and could reach up to 15 metres high in places. In addition to the fortifications, there was said to be a system of escape tunnels under the castle that led to extensive caves in the surrounding sandstone geology. During the Hussite Wars (1419-1434), Trosky served as a base for pro Catholic activities. 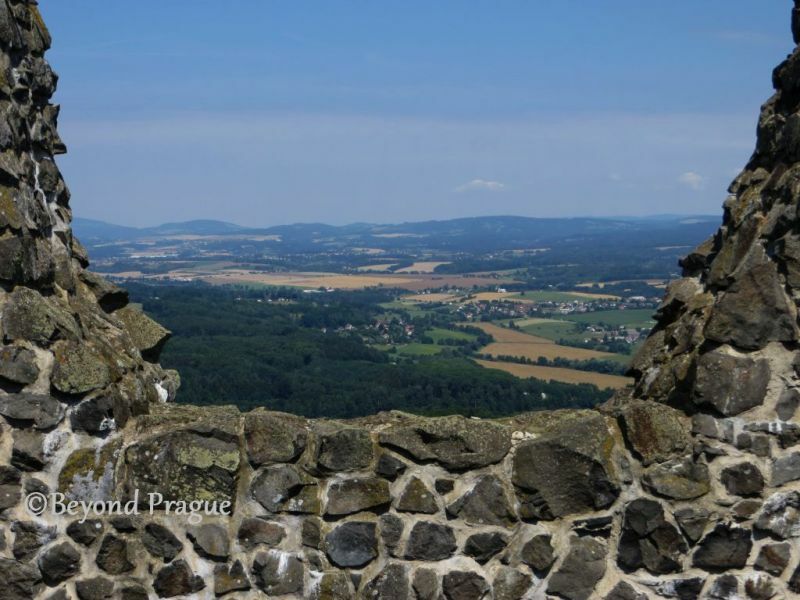 While Hussite forces tried to lay siege to the castle, they were ultimately not able to conquer it. From 1438 to 1444, the castle served as a base for a gang of robbers to terrorize the citizens of the region from. Due to the castle’s fortifications, it took local army regiments three years to completely drive the criminals from the castle. The castle passed through many owners and steadily declined in importance between the Hussite Wars and the outbreak of the Thirty Years’ War in 1618. During a battle in 1648, the castle was set fire to and left a ruin. The last major noble family to own Trosky were the Valdštejns. The castle came into their possession during the Thirty Years’ War and remained theirs until they sold it on in the early 1820s to the von Aehrenthal family. Austrian diplomat, Count Alois Lexa von Aehrenthal (1854 – 1912), had inherited the ruins of Trosky and was the first person to take an interest in restoring them to some extent. Under Aehrenthal’s ownership, the ruins received some stylistic modifications that were influenced by the Romanticism movement which was popular in the early to mid 19th century. He had also planned to have a staircase leading to the top of the Panna tower constructed. Building of the stairs was started, but the count’s unexpected death signalled the cessation of further work on that project. 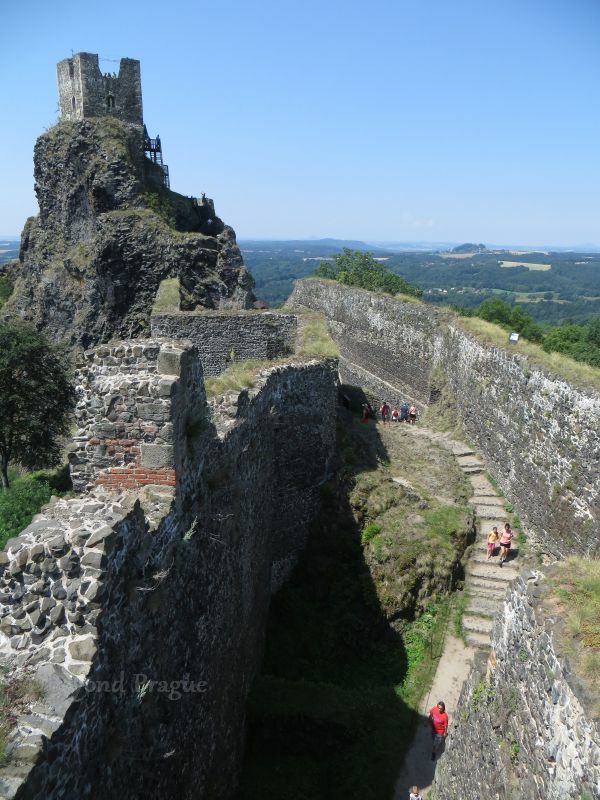 Following Aehrenthal’s death, interest was taken by the Czech Tourist Club in maintaining the ruins at a small level. Major restoration work has taken place since 1925, when Trosky came under state ownership. Today it is administered by the State Heritage Institute in Pardubice. Taking in the view from the Baba tower. Trosky is open to visitors from April to October, but the exact hours and days of operation are variable upon the month. While it is possible to take guided tours, you can also do a self-guided tour if you prefer. Beyond taking in the details and atmosphere of the ruins, the main reason to visit Trosky is most certainly the fantastic views it can give you of the surrounding countryside. It can’t be stressed enough that visiting Trosky if you don’t have a car or are part of a coach tour will require you to put in a good deal of physical effort. 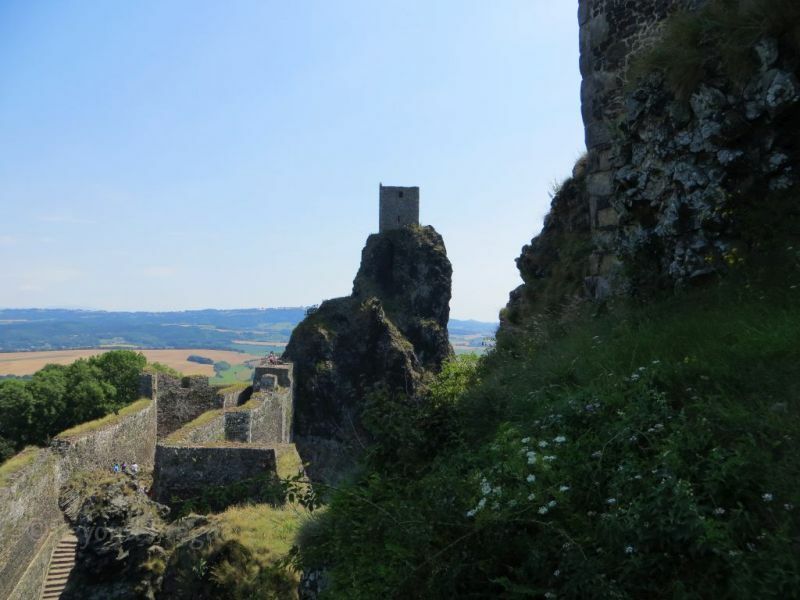 Several cycling and walking paths will take you to the castle, but it’s good to do your research first and choose one that best suits your ability. I suggest contacting the Český ráj tourism office and asking them for information about the relative levels of difficulty of the various trails that lead to Trosky. We put in much more effort than we expected to when we visited Trosky, but the views were a most worthwhile reward for those efforts. Another view of the castle, clearly showing the basalt base it’s built upon.